I am spending lot of time and effort for regularly adding useful & interesting Videos and latest technology news videos. Our channel is getting many new subscribers daily, and view count is getting increased steadily. Right now I am earning money by showing Google Adsense ads in the youtube channel as I explained in this video. But earnings from Google adsense is low comparing with the affiliate earnings reported by many other similar youtube channel owners. Few years back, I thought about participating in affiliate marketing to earn additional money from our websites and youtube traffic. I explored few affiliate programs. But that time I didn't choose to focus on affiliate programs, as I thought it will take lot of efforts to earn any significant money. But now I decided to opt the affiliate program as youtube it self encouraging that activity. After exploring various affiliate programs I decided to choose Spreadshirt which is officially supported by Google/Youtube. I created a shop at https://shop.spreadshirt.com/QualityPointTech/ and regularly adding many T-Shirts and other products with Quotes and other designs. It seems spreadshirt will pay 20% as affiliate commission and apart from affiliate commission it will pay volume commission for selling more products in specified time. And, it allows us to set our own price for our designs. So, I hope it will be useful for earning some additional money apart from earning from Google Adsense. While I am exploring options to earn from Spreadshirt shop, at the same time I am very keen on keeping the shop really useful for the customers. I take every possible step to keep the price minimum. For example, I am using designs from free open art designs instead of using the marketplace designs which will increase the price further. 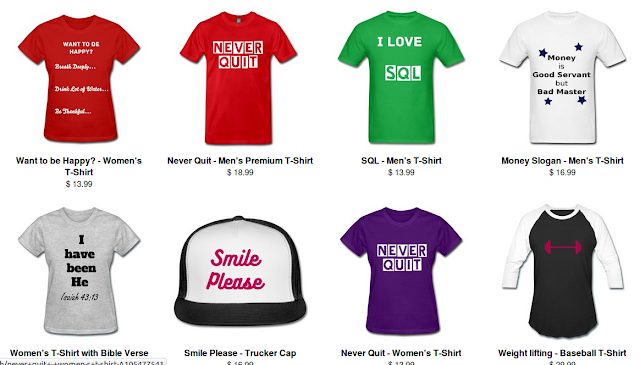 And, spreadshirt is offering some discounts at certain time periods. For example, while writing this post it is offering 15% off for any order. Share your suggestions to improve our shop further.